Relaxation Location with Ocean View! #1 - Location, location, location! #5 - Walking distance to just about everything including restaurants, shopping, spas, snorkeling, golf, ocean activities, and more. #6 - Spacious unit 1400 sq. ft.
#9 - A condo that feels like you're on vacation in Maui, with all the comforts of home. #10 - Not ONLY a new kitchen, but new carpeting, a huge TV (that one's for the guys), and new furnishings (that one's for the gals). Located in the heart of Kaanapali, the Maui Eldorado is a quiet resort just minutes away from one of the best sandy beaches in the world. One of the greatest things about this location is that you can walk to RESTAURANTS, HOTELS, SHOPPING, SPAS, LUAUS, GOLF, and much more. The historic town of Lahaina is only a 10 minute drive and Whaler’s Village Shopping Center is a leisurely 10 minute walk. 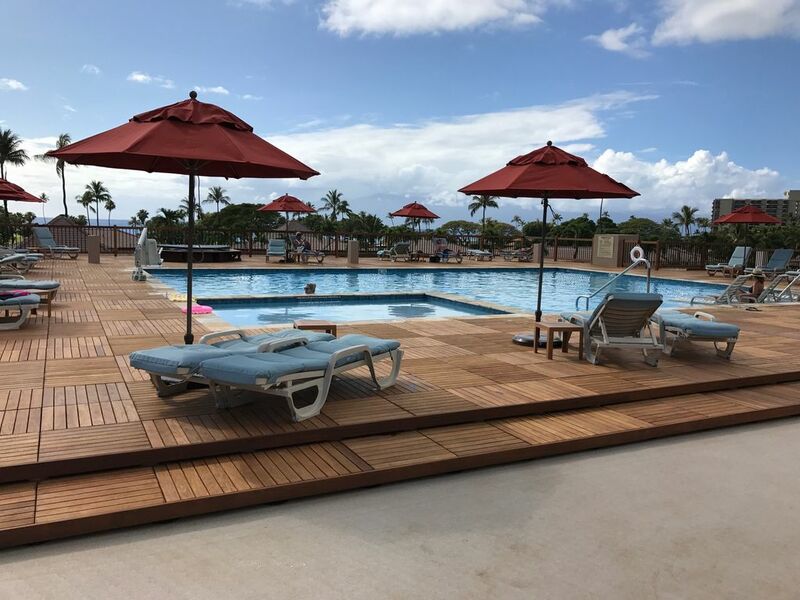 Choose from one of 3 swimming pools at the Maui Eldorado. One is located just out the front entrance to the condo, while the other is just steps away from the ocean view lanai. The pools are gated and it is never a problem finding available lounge chairs on the pool deck. Enjoy views of Molokai and the ocean from your very own lanai. In under 10 minutes, you can walk through the Royal Kaanapali North Golf Course to a PRIVATE BEACH CABANA reserved exclusively for Maui Eldorado guests. The cabana is equipped with towel service, a kitchen, shaded lounge area, beach chairs, and restrooms. This unit is an excellent value for the space and quality it offers. It is ideal for large families and/or multiple families who still desire privacy and space. We cordially invite you to this little bit of Heaven on the Island of Maui. We had enjoyed many trips to Maui when we were a young married couple. Eventually we had children and realized that hotels were not the most economical way to vacation with a young family. We had the opportunity to purchase F104 in 2003 and decided that the timing was right. Since then, we have done extensive upgrades to the property and have experienced the wonderful benefits of property ownership on the island. We are grateful for all of our guests past and present. We hope that you will enjoy our home and all the gorgeous sights and sounds of Maui! The Kaanapali Resort area ranks #1 in beaches all over the world! We also found this area to have the perfect mix of activities and 'quietude' that we wanted. You can relax for many days by the pool, then jump on boat for fishing or snorkeling the next day. There are so many things that are within walking distance from our condo. Here are just a few of them: world's best beaches (with cabana), several amazing swimming pools right outside the door, whales spouting on the horizon during migratory season (Nov. - May), restaurants, shopping, boating activities and tours, convenience store, gas grilles, an amazing corner location, lots of interior space, and more! In an effort to keep costs down, AC only works when patio sliders are closed. Please remove bedding for off-site cleaning at the end of your stay. Stackable washer/dryer unit provided in front bathroom closet. A supply of laundry soap is provided for your use during your stay. Please park in covered parking garage. This is where you park your vehicle during your stay. Parking location TBD when pool construction begins (4/16 - 9/16). Wifi provided. Please look on the modem for password instructions. Bath towels provided and beach towels provided for use by the pool. Please check out towels at the cabana for use at the cabana and the beach. Return to cabana attendant before you leave. This is NOT on-site, but Valley Isle Fitness is $75/week and is located in the strip mall across from the Maui Eldorado Resort. Sleeper sofa and love seat. With large 55" TV. Dishwasher tablets are provided for your stay. Stainless, side-by-side with built-in ice maker. Several drip coffee makers in the kitchen. Filters provided in the cabinet. Some seasonings, salt, pepper are in the cabinet to the left of the stove. Lovely, remodeled galley type kitchen with open bar concept. Lots of storage in lower cabinets. Dining area inside condo seats 4, but outside patio dining table has seating for 6. All flat panel TVs in each bedroom. New TV in living room has Pandora, Amazon, Netflix, Hulu, etc. Just need your own login info. Many paperbacks are shared at the condo and also on the bookshelf at the cabana. We have given and taken several good reads over the years. There is almost always a huge supply of sand toys in our unit. We would recommend that you check out the inventory prior to purchasing any. Boogie boards & noodles are usually available in the condo. Sloped grassy area outside of the condo is a great spot for kids to play and hunt for geekos! Snorkel gear is usally left at our unit by other guests, but we encourage you to be fitted for snorkel gear at The Snorkel Store which is located in the Fairway Shops across from Maui Eldorado. Sessions are available at the Sheraton for a fee. Lots of golf opportunities at Kaanapali, Kapalua, etc. Sorry, that there are not usually discounts offered unless you have a Hawaii Driver's license. Completely enjoyed our stay at this resort! Close to everything, clean, awesome grounds and awesome staff. Highly recommend to anyone going to Maui! Kaanapali is a resort area that appeals to a wide range of interests. For those who love outdoor activities, there is snorkeling, hiking, tennis, golf, zip-lines, etc. For people who love spa treatments and shopping, there are many options within walking distance. This is a highly desirable location for returning travelers as well as first time visitors to the island. You will not be disappointed with what Kaanapali has to offer!